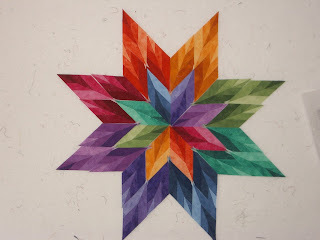 Don't forget to check out the previous post announcing my new String Quilts book arrival! Star Crystal in process— Where has the time gone? 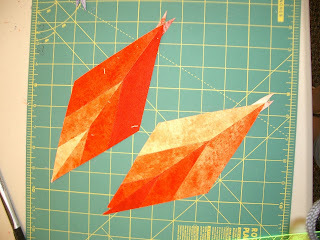 And Where is the blog I promised on Freezer Paper appliqué? 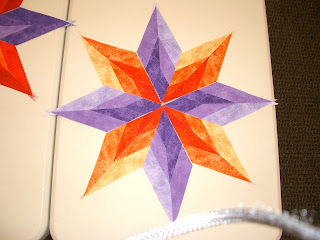 It is coming, but I took some time off to actually start a new quilt! I'm so excited about it because of all the colors I'm using this time around. I found Karen Comb's new line called Shade Cascade. It has 4 separate values of the same color across the width of the yardage, so if you buy 1 yard, it is the equivalent of buying 4 fat quarters of 4 shades of fabric. 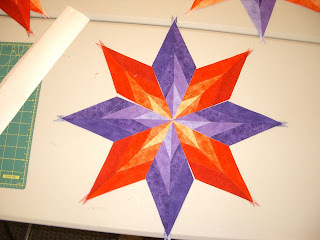 It looks like hand-dyes, solid, but with a little textural effect. Works great for my Wall Flower class. As a matter of fact, that's how I discovered this wonderful line. 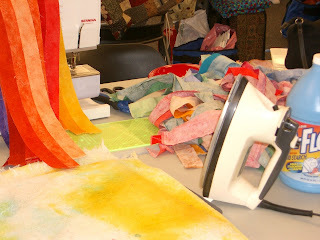 When I taught the class in Galena, Illinois last month at Phat Quarters, Jane Michal had ordered a bunch of this line of fabrics for students to use as an alternative to very expensive hand dyes. I bought 1 yard of every color she had in the shop, then got online and bought 1 yard of each of the other colors in this line. 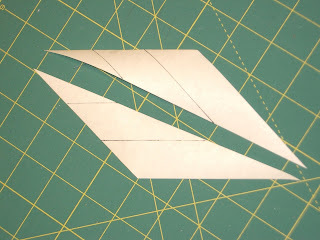 I started out by cutting lots of strips, lots of them, and sewing them together: Then I made Freezer Paper templates, ironed them onto the strips sets, and used my Star Ruler to cut out the pieces: The pieces are then stitched together to make Chevroned points, and that's when the designing begins. 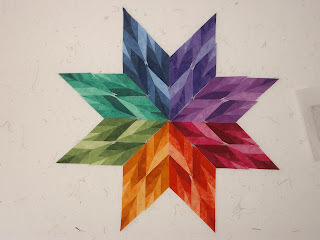 Here are a couple of for the quilt center that I explored: I'm planning to share each step of the process I'll be going through to plan, design, and create this hope-to-be competition quilt. Tomorrow: more design wall play. I love how you do these. 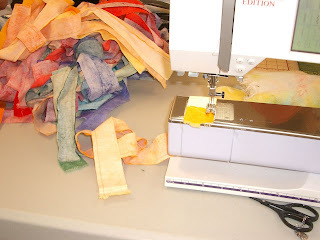 I am a fan of very scrappy quilts, so your technique works well for that. Of the above, I like the bottome one best...the top one draws your eye into the depth of the star, the 2nd one seems to burst with color. Thanks for showing this quilt start to finish...now to find someone local (closest quilt shop is 35 miles each way...for me ...that's local!) that carries this line.